First off, let’s review the amazing work Grays have done on style for their 2017 range of hockey sticks! Wow! We have previously described Grays as having a look only a mother could love, in 2017 they’ve flown the nest and are looking for love! Style isn’t everything, it does help though, and the 2017 models of Grays Hockey sticks are not only looking amazing, as usual they are packed full of Grays quality. Reduced from 60 to 39 hockey sticks in 2017, Grays have gone for quality not quantity and here’s the best run down of the ranges and models available to buy online. The features that make this small range the best of Grays hockey sticks in 2017 are the use of ‘Braided’ carbon which was first seen a couple of years ago on sale buy adidas. This is a newer technology for making the sticks which creates incredible strength in the stick. Also, seemingly unique to Grays as I write this at the end of the 2016/17 season in the UK, the gloriously named Geocentric Core Technology. It’s basically the filling of the hockey stick, it’s clever as it combines toughness and weight to create a light and balanced hockey stick. If you are considering buying a top end hockey stick on sale, the Grays KN should be part of your considerations and having felt one of these in action I can’t recommend enough that you go and feel one before spending all that cash. Grays GR range of hockey sticks in 2017 have had a beautiful facelift, the design now includes the cool looking honeycomb effect around the head and top of the shaft. It’s obviously not just the design, this GR (which stands for Graphene) does add to the power and durability of these hockey sticks. Graphene is a type of resin material that glues together the carbon and other materials to make the sticks strong. There’s a great choice to buy in the Grays GR range, with different shapes and material compositions on sale to meet any style and budget. Grays GR range of sticks would suit a regular team player, training and playing every week, like all Grays hockey sticks you should see a few seasons out of the Grays GR. What can you say about the GX range of sticks from Grays thay hasn’t been said before, they are great for the balance of cost vs quality and 2017 is no different. All Grays sticks are top quality, build with durability in mind and even the design of the GX range has been spruced up a little this year. No major updates for the Grays GX range in 2017, just more of the same good quality sticks with a choice of specification. There are fewer shape choices to buyand if you want low bow Grays hockey sticks in the Probow or Jumbow shape you need to step up to a GR, however if you like the shapes available and your money, the Grays GX hockey sticks are on sale for you. There are 5 shapes of shaft across the 2017 Grays hockey stick range. From the low and wild to the high and steady, you can pick from these shapes and match them to the specification (in most cases) you are looking for to get a great Grays hockey stick. Probow – Grays Probow hockey sticks are as low as you can get on sale. These bows are very pronounced at 200mm up from the floor, making the top of the stick feel straight with the big curve of 24.5m down low. Jumbow – Grays Jumbow hockey sticks have the same low position of the curve as the Probow, 200mm, but these sticks are more of a steady bow shape right from the tip of the handle to the head. Perfect shape for those who buy to have a range of skills from 3D to quick indian dribbling. 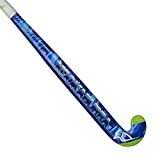 Dynabow – Grays Dynabow hockey stick shape is on sale for the player who like a big bow but wants it higher in the stick. Like the Jumbow the whole length of the sticks curves and the main apex of the bow is up slightly higher at 250mm from the heel. Midbow – Grays Midbow hockey sticks are normally the choice to buy for defenders and those who rely more on their ability to slap or pass than dribble or flick. This shape is onsale with a big curve of 24.5mm at the highest position on the stick of 300mm up from the heel, making the lower part of the shaft straighter. Ultrabow – Grays Ultrabow hockey sticks are on sale in 2017 for those players who prefer less bend. These feel much straighter with no significant kink as you buy it with just a 22mm curve at 300mm up from the heel. Hat’s off to Grays in 2017, with the ever increasing new brands in hockey making hockey sticks as much about design as technology, Grays range on sale this year have kept their classic features and had a great design overhaul. They now play hard and look pretty too.